Ilana Shafir was born in 1924 in Sarajevo, former Yugoslavia. 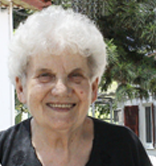 Ilana was a student at the high school for architecture, when her studies were interrupted by the Nazi invasion of Yugoslavia. The family escaped to the southern region of the country which was under Italian rule. Ilana began to paint the landscapes of the small village of Kula where the family had taken refuge. Looking visibly different from the local villagers, it was clear to everyone, including the Italian soldiers, and later the German ones and their commanders, that her family did not belong to the village. Had anybody revealed their true identity, they would have been lost, but they survived thanks to the fact that not a single soul, neither child or adult so much as mentioned the word "Jews." After the war, Ilana was able to begin her studies at the Zagreb Art Academy from which she graduated in 1949. Shortly thereafter the family immigrated to Israel to finally settle in Ashkelon, which was at that time a small settlement of just a few families. Ilana started to paint and draw newcomers in a nearby transit camp. This creative period culminated in exhibitions in Israel, Holland, and Switzerland. The work of this period reflects the sadness and suffering of the Jews. In the early sixties Ilana no longer felt the urge to depict sad Jewish faces and began to look for a new direction and means of expression. It was at this point that she started working in mosaics and watercolors. She worked on small mosaic projects but quickly larger commissions came for both public and private commissions. Throughout this time, there were periods of intensive painting in watercolors as well as exhibitions of these works. Ilana, however, always returned to mosaics. The two techniques, despite their differences, influenced each other in a creative way. Contemporaneously, Ilana created ceramic sculptures which reflect another side of her creativity. For years, Ilana was also a dedicated art teacher and later founder and director of the Ashkelon Art Center, a flourishing educational institution with multimedia studios which provided art education for students and adults in Ashkelon. Since 1980, Ilana is an active participant in the growing community of mosaic artists throughout the world and often invited as a guest speaker in national and international mosaic conferences. She is a member of AIMC (International Association of Modern Mosaic Artist, Ravenna, Italy) and a member of SAMA (Society of American Mosaic Artists). Ilana's work has been recognized in various venues. Her mosaic "Gate of The Souls" received the Curator's Choice Award at the inaugural exhibition of SAMA held in 2002 in Orangeburg SC. Another mosaic, "In the Deep," was recognized as the Best Large Scale Contemporary Work at the SAMA exhibition at the Eleven Eleven Gallery in Washington DC. Recently, Ilana's poster won the award for the category Mosaic as Art at the poster exhibition in Melbourne, Australia, held in 2005 at the AIMC Conference. In 2004, Ilana's mosaic "Worlds" was installed in the lobby of the Ashkelon Cultural Center and was recognized in a ceremony attended by the mayor of the city. The film "The Worlds of Ilana Shafir", made by Giora Shafir ( Ilana's son and the architect of the building), was premiered in the event.